With the advent of digital tools for mapping and geographic information systems (GIS), the increased ability to narrate stories and conduct research over space and time has furnished scholars with new opportunities to visualize their work geospatially. Equally, the adoption of other visualization approaches—from graphs and trees to network diagrams and infographics—has enriched discussions and provided arguments on a variety topics, cutting across the humanities, social sciences, and sciences—as well as beyond the academy. This LOCUS seeks to bring together the narration and visualization of space to examine how scholars and journalists use these new tools and techniques in the their work—whether with fully developed projects, projects in process, or ideas for new projects. 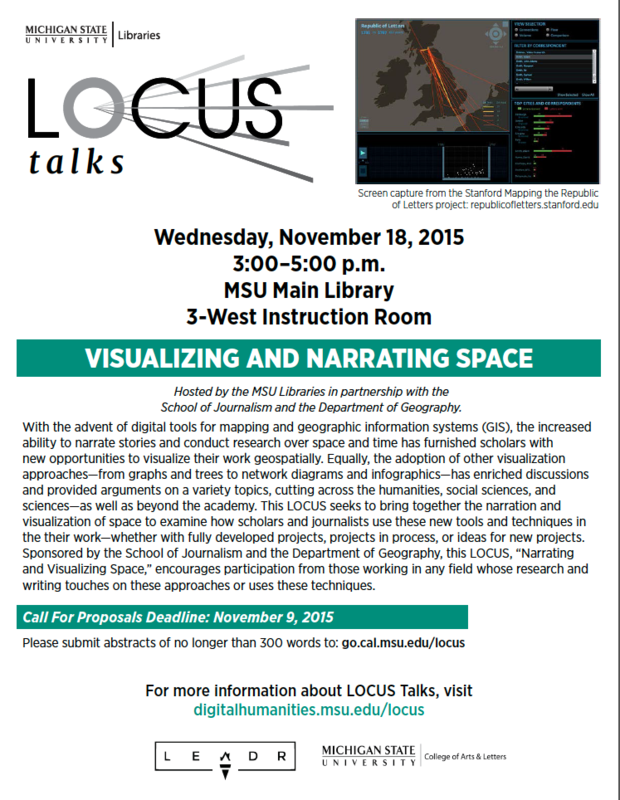 Sponsored by the School of Journalism and the Department of Geography, this LOCUS, “Narrating and Visualizing Space,” encourages participation from those working in any field whose research and writing touches on these approaches or uses these techniques. This presentation for “Visualizing and Narrating Space” will focus on land cover change research in Zambia being done as part of a graduate level Remote Sensing class. This in-progress project looks at how large-scale agriculture has developed in the region near Kitwe, Zambia from 1997 to 2011, with the hypothesis that there has been an overall increase in large-scale agriculture. This presentation will walk the audience through how to conceptualize space at each stage of the research as well as what visualization tools are used for each stage of spatial analysis. This presentation will show the audience three different software: TRIMBLE eCognition, ESRI ArcMap, and Adobe Illustrator. This presentation will first discuss what constitutes a large-scale farm. Second, it will show how eCognition’s object-based image analysis allows geographers and other researchers to pull out land cover features of interest that might be hard to differentiate in a traditional, pixel-based image analysis (i.e. differentiating large-scale farms from small ones and other vegetation). Next, mixed analysis and visualization capabilities of ArcMap will be displayed as the resulting land cover classifications are brought into ArcMap for further analysis. Finally, the finishing touches are put on the classification and change maps in Adobe Illustrator. This presentation highlights the importance of understanding multiple tools and techniques in spatial analysis as different stages of research require different approaches to visualizing and understanding the space in question. Michigan State University’s archive of aerial images helps explain land use changes. NASA satellite images explores the Great Lakes environment. Computer modeling of oil spills and other environmental phenomenon lays groundwork for explanatory animation. Immersive multimedia is content that allows participants to engage in a more tangible and interactive context through placing them within environments from either the real world or computer-replicated simulations. While originally developed to immerse users within games, this technology has recently transitioned outside of the gaming industry into fields such as education, business and healthcare. We believe that with the right direction, immersive multimedia can further benefit existing pedagogy. While the utilization of these technologies within academia have been relatively basic, with continued practice and support for these new methods we could see far greater content being developed to help the academic community prosper. For example, the implementation of technologies such as virtual and augmented reality, along with new forms of video (e.g. 360 degree videos), immersive multimedia could enhance the education experience for students by engaging them deeper in the materials. This presentation will cover an introductory overview of immersive multimedia, its potential to benefit education and several methods of achieving the application of these new technologies into existing pedagogy. To showcase real-world application, attendees will be presented with how the MSU College of Arts and Letters’ Innovation Team has experimented with systems to quickly prototype virtual environments and how Dr. Jon Frey is working to use immersive and embodied experiences to aid in the delivery of art historical content in the classroom.